You are in charge of your own stories. You can tell yourself you are worthless or you can tell yourself you are worthy. Simple right? 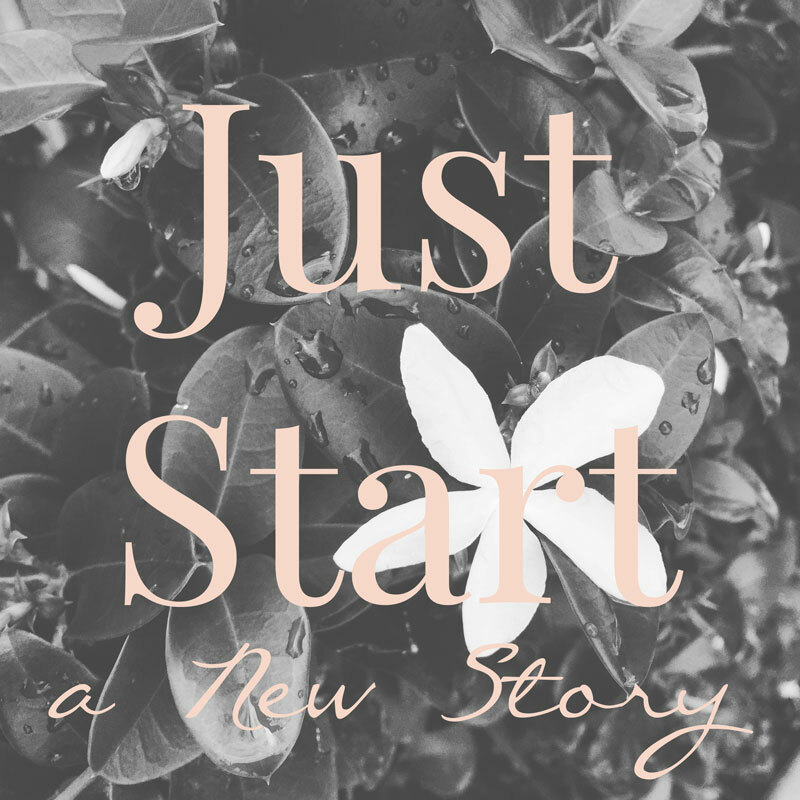 Oftentimes, not so much… Today, as part of Just Start (& self-esteem continued…) month, I’m sharing how mindfulness, vulnerability, and creativity can help you Just Start a new story. For many of us it’s hard to change the skipping record in your head related to your self-esteem. It’s not always easy to STOP telling yourself one story and to START telling yourself something else. Especially, if it’s a story you’ve told yourself for a long time. You can’t start a new chapter of your life if you keep re-reading the last one. That would be like waving a magic wand. 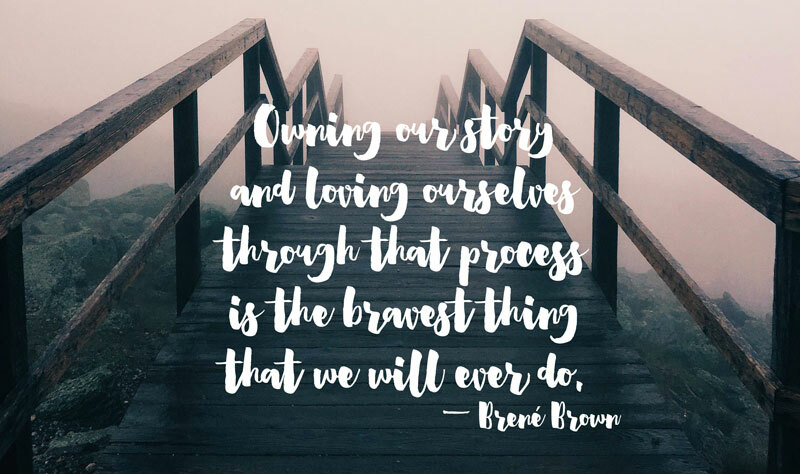 In her most recent book, Rising Strong, Brené Brown continues her compelling narrative related to shame and how after a struggle you can not only recognize and own your stories but rise beyond them. I’ve found this to be true in my life time and time again. Through her first book, I Thought It Was Just Me (But It Isn’t), I learned about and began to have an understanding around shame and emotions (Thank you Brené Brown). That in itself was life-changing but there were still other areas of my life where I continued to struggle. Mostly the story I was unknowingly telling myself about self-esteem. I had told myself the same story for so long. Feelings of unworthiness, not being enough, comparison, external validation and lots of other symptoms. All of that translating into low self-esteem. In order to Just Start a new story you have to first become aware of, own, and rise beyond, the story you’ve been telling yourself for so long. 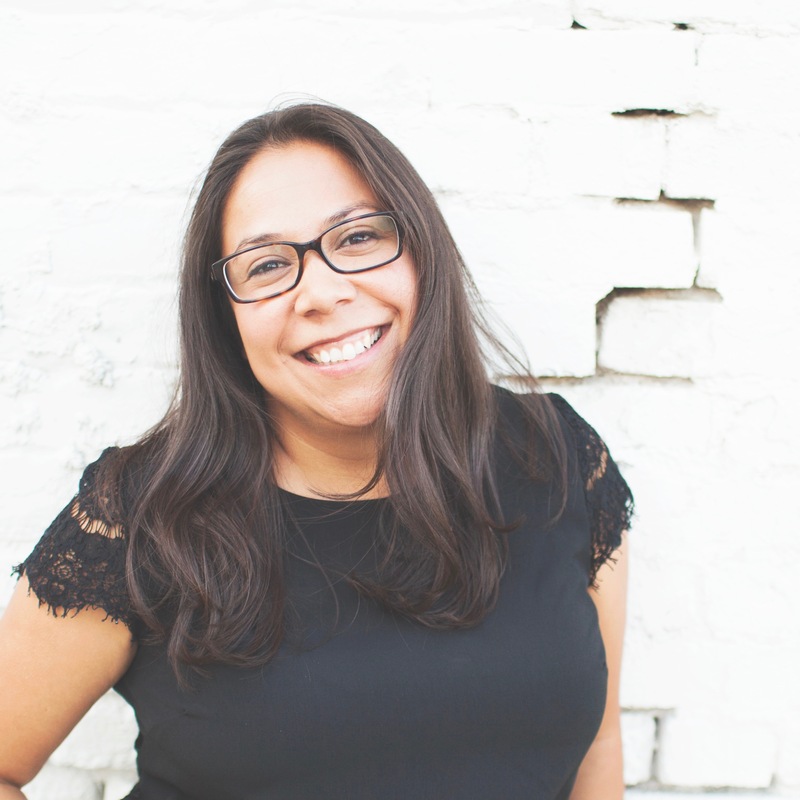 Here’s how I’m learning to own my self-esteem story and how the journey can teach you to live an inspired life and Just Start a new story of your own. Mindfulness asks you to recognize and accept where you are, in this moment. Where you are, in this moment, may not be a great place (low self-esteem and negative self-talk are never a great place to be), but that’s not where you have to keep going. Through mindfulness and meditation, I was able to start recognizing my own low self-esteem and negative self-talk moments. I became further aware of when they were happening. I’ll say it once and I’ll say it again. Awareness is the first step. Brené calls it the reckoning. I think it is. To just start a new story you have to take a deep, hard look at yourself and be able to say yeah, I need help in that area. Low self-esteem had been the record in my head for so long. In order to let it go I needed to own my story. I needed to not just be aware of but to sit with those feelings. Really sit with them and be gently curious. What’s coming up when those negative self-talk moments are happening? Where are those feelings in my body? Why are they here? What just happened? What happened was a big “Whoa!” These feelings are real and they’re hard, but they’re not who I am. They’re often triggered by comparison, by disconnection, by being anything less than authentic. I can let this go. I was finally able to look at that old story with gentle curiosity and see where that curiosity would lead. Brené calls this part the rumble. Once you’ve reckoned with what you’re dealing with, you have to rumble with it. To just start a new story you have to really take the time to work it out. Which is not an easy thing when it comes to negative self-talk and low self-esteem. It’ll be a back and forth but if you keep working through it, you’ll come out better on the other side. These feelings are real and they’re hard, but they’re not who I am. I believe creativity is a natural reaction to struggle. Whether it be to document the journey or to help you further process what happened. Or even to craft a beautiful new story you could never have imagined before. For me, struggle leads to sharing my story through scrapbooking and through writing. It wasn’t always that way but after holding my own negative self-talk in my head for so many years, the way I can be true to myself is by letting these stories out. I scrapbook and write about my story to have proof of the struggle, to see how far I’ve come, to share with my family, and with the world. I scrapbook and write about my story in the hopes of connecting with and inspiring and empowering others who may be struggling with the same issues. I’ve shared (and will keep sharing) my stories in an authentic and creative way and that in itself is allowing me to let go even more. It’s allowing me to forge a brave new path where I was always afraid to before. Friday morning, walking home after school drop-off, I realized I’m really happy where I am right now. I am sharing my story not just in this space, but with new friends, and old friends, and very soon with an even larger community as a social worker and I’m not afraid. I’m excited. I’m hopeful that my experiences and my struggles with creativity, and emotions, and grief, and mindfulness, and vulnerability can impact someone else. If just one person is changed through my story well that’s it, that’s what it’s all about…and I already know people have been affected just looking at my own little family. Brené calls this The Revolution. Absolutely. Each part of this process is important and necessary. Nothing can be skipped. It doesn’t happen overnight. It’s taken months, maybe even years, to finally recognize and let go of the negative thinking I had been attached to for so long, but to truly Just Start a new story you have to dive deep into the process to come out on the other side, Rising Strong. Brené Brown says the middle is the most important. She calls it the messy middle where you wrestle with your own thoughts about what you’re struggling with. I would argue that you can’t change anything until you recognize there’s a problem. I think establishing mindfulness is the key. In my list, I added each step in the process to the previous ones (i.e. Be Mindful, Be Vulnerable). You can’t just move on to being vulnerable and forget about being mindful. If you’re ultimate goal is to live an open- or whole-hearted life, than mindfulness, vulnerability, and creativity are not just a part of the journey through struggle but they are a part of the journey through life. The struggles aren’t over but each time you face a new one or start telling yourself a new story that isn’t helping, and may even be hurting, you can be aware of it, own it, and rise beyond it. You can Just Start a new story. Just Start a new story by practicing mindfulness and staying aware of your behaviors, feelings, and thoughts. Just Start a new story by being vulnerable enough to sit with those behaviors, feelings, and thoughts as they arise. Brave enough to sit with them and gently let them go knowing that they’re not needed. Just Start a new story by authentically and creatively connecting with others and sharing your story. Just Start a new story by creatively forging a new path. Mindfulness, vulnerability, and creativity are my new story. Just Start yours. Thank you for spending a moment with me. I am grateful for you. What is your new story? Let me know in the comments. I LOVE Brene Brown. Truly, she’s such an inspiring person. I haven’t read her books, but the second I have a chance, I will. Thanks for this inspiring article! I commented on Blogging Boost but that post was SO long I couldn’t find you again. Anyway, I’m connecting here. Thanks for the inspiration and the wonderful message! I’m sharing this with my goal setting + accountability group to inspire them to start something new. Yes! Brene’s books are definitely dense with learning. It took me a few a weeks to get through it too. Thanks so much for reading and for your comment! Have a great weekend! This post is so timely for me. I have a situation right now that I am struggling with, concerning a former friend of mine. I keep circling back to feelings of rejection and loss and I am at a loss of how to move past this…for good. It’s been 6 years and I am tired of pining over it. Acceptance is so hard…but so necessary. I am glad this post could be helpful for you Sarah. I love how once we come into awareness around the stories we tell ourselves it opens us up to acceptance (as you said) and so much more. Thank you for reading! I have been going through the back log of blogs that I am behind on and just read this post, which brought me to tears. Two days before you published this post, I said goodbye to my unborn daughter. What I went through, and am still going through, has been a tumultuous journey of pain and healing. As a writer, the idea of “starting a new story” is SO poignant for me, and this bit in particular made me do a little happy dance in my chair: “You can’t start a new chapter of your life if you keep re-reading the last one.” Oh man. THAT. So much THAT. Thank you for sharing your wisdom. I needed it! Thank you so much. It is deeply moving to know that this post could help you through such a HARD experience. Having experienced the depths of grief I am right there with you and sending hugs and love. Thank you for nominating me for the Liebster Award. I participated last year so I’m going to pass this time around. Again thank you so much for the kind and motivating words.